(APN) ATLANTA — Atlanta appears set to follow the example set by Clarkston, Georgia, which in 2016 reduced the possible penalties for possession of one ounce of cannabis (“marijuana”). At the last meeting of the Atlanta City Council’s Public Safety/Legal Administration Committee, the Committee voted to recommend approval of an ordinance by Councilman Kwanza Hall (District 2), 17-O-1152, to lower the municipal penalties such as to eliminate the possibility of jail time and reduce the maximum fine to 75 dollars. The current fine under Atlanta’s municipal code for under one ounce of marijuana is up to one thousand dollars and up to six months in jail. Most reasonable people find that to be extreme. 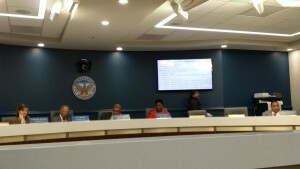 The meeting was highly contentious and suspenseful, as it did not appear the legislation would pass until the end when–after testimony that was at times emotional and reflecting the frustration of audience members–Councilwoman Felicia Moore (District 9) made an substitute motion to move forward with recommendation. “Our goal is to reclassify this egregious punishment that has been put on the backs of mostly African Americans and Latino men and women who are incarcerated in our jail… We are not decriminalizing or legalizing, but reclassifying so it goes to a ticket,” Councilman Hall said. 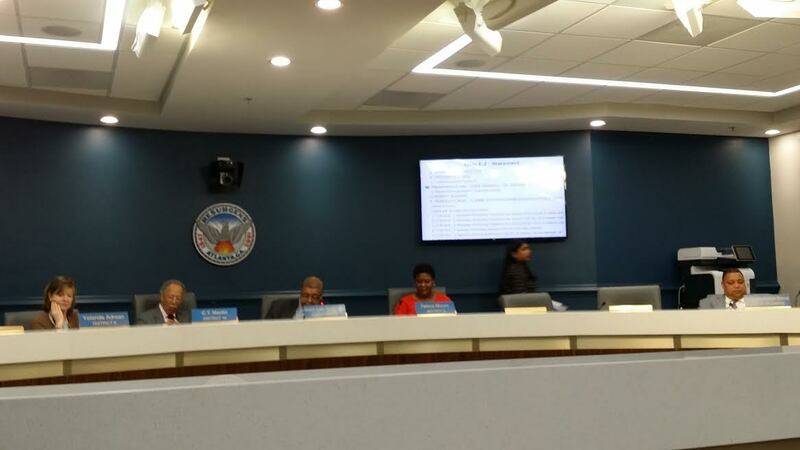 Councilwoman Yolanda Adrean (District 8) desired more official statements from stakeholders, such as the Atlanta Police Chief, Atlanta Public Schools, the Concerned Black Clergy, and the Center for Disease Control (CDC). Adrean also wants data from the jail on how many individuals are incarcerated for possession of less than one ounce of marijuana, and from the courts on the number of cases they adjudicate for possession of less than one ounce. She expressed frustration that she had requested these things at prior Work Sessions, but no one seemed to track the requests. Hall assured the Committee that Concerned Black Clergy was sending a letter stating that they don’t oppose the ordinance. Meanwhile, Katrina Taylor-Parks from the Mayor’s office said she wanted time to bring stakeholders, including the courts, into a conversation. Because of this, it seemed that it would not pass at first. Councilwoman Adrean said she was not ready yet to move forward. Councilwoman Moore asked Amber Robinson of the Law Department if there were any legal concerns with the legislation and Robinson said no. A previous version would have eliminated the municipal code section entirely, which Robinson previously opined would leave Atlanta police with no option other than to enforce state law if they were to make an arrest for cannabis possession. Through this line of questioning, she made clear that there were no legal concerns, raising the question as to why the additional stakeholder engagement–which is to take place over the next three weeks while the Council is on recess–should be a barrier to moving forward. Two Work Sessions have been held in recent weeks, and Mayor Ted Terry of Clarkston had testified to the Committee that they adopted a 75 dollar fine under an opinion from their law department, so that the fine wouldn’t seem so small as to be a non-deterrent. Advocates didn’t agree with that assumption. “75 dollars is too much money to demand of people who are already struggling to survive. No one should have to choose between paying a ticket and their rent,” Dean Steed, a community organizer for Solutions Not Punishment (SNaP) Coalition, said. “Stop throwing people in cages, stop forcing families to come up with bail money, what seems like a reasonable fine for you is not reasonable to us and maybe you all live too far above and beyond the poverty line to know how…” Steed’s voice breaks and the sentence is never finished. “This country incarcerates more people than any place else in the world. The black community has been targeted by the drug war for the past 40 years and has between 80 to 100 million people living with criminal records from the drug war,” Doug Hanson said. “The State of Georgia is number one with people on probation, or one in every twelve citizens in Georgia is on probation,” Hanson said. “Georgia has 200 jails, 180 prisons, 22 youth detention facilities, five immigrant detention facilities, it a slave catching state. We went from slavery to Jim Crow, to segregation, to the war on drugs, to hyper-criminalization, to mass incarceration – when is it going to stop?” Hanson said. Meanwhile, Councilman Bond expressed his hesitation to support the legislation because he appears to be traumatized by the 1960’s drug culture he lived through as a small child. “Mr. Bond when you say drugs ravaged your neighborhood. Which drugs were you talking about, heroin, crack cocaine, crystal meth? I have never seen marijuana as the source that ravaged neighborhoods. I don’t know a person from coast to coast that has destroyed their lives with marijuana. I have seen lives destroyed by crack cocaine, heroin, and meth,” Lynn Morrison said. “I’m going to make a… motion to hold this in favor of having a transparent conversation on the record with other stakeholders and give the administration time to get their ducks in a row. What difference does a couple of more week make?”Adrean asked. “When you ask what is the rush, what is the point of waiting another week, month, another six months? The risk of another young Black man being shot because an officer smells marijuana on him. That is why people are upset that you are not willing to vote on this,” Che Johnson-Long, Organizing Director, Racial Justice Action Center, responded during public comment. “After the death of DeAundre Phillips based on the smell of marijuana, Councilmembers seem to understand this is an urgent piece of legislation and now Councilmembers are asking what is the big deal? Phillips’ family and families across Atlanta that has been impacted by imprisonment, fines and fees and state violence since July finds this to be a big deal,” Kamau Walton said. Councilman Hall had first introduced his criminal justice reform package in July. Councilwoman Adrean later apologized for asking what was the big deal, admitting it was insensitive. Councilman Young (District 3), who was chairing the meeting as Vice Chair, made a motion to move forward without recommendation, but did not get a second for his motion. Adrean made another motion to hold legislation and it was second by Bond. Adrean and Bond voted yea; Moore and Ivory Young voted nay; and CT Martin (District 10) abstained. So the motion to hold did not pass, 2-2. Moore then offered a substituent motion to approve under the condition the requested stakeholders meet. “If there are some glaring issues they can bring to us when we come back and if we need to send it back to committee I’m willing to do that if additional information comes out,” Moore said. The vote was four yeas and Bond abstained. The Full Council will vote on the legislation at the next meeting on April 17, 2017. The City of Temple, Georgia, is also considering decriminalization. It is a city of 4,000 people, west of Atlanta, between Douglasville and the Alabama line. Great article, great news, Gloria!! Glad to see where Che landed after her tenure with Georgia WAND.